My blog titles are mostly musical references. This is a blog about GPS systems, I think. I did toy with the idea of writing one about the brake problems some participants in our European Grinnall Scorpion tour have been having. A good title for that would have been “Ain’t No Stopping Us Now”, I suppose. We’re almost at the end of our Grinnall Tour. What’s left of the main group have left us, and hurried off north today, theoretically via the Nurbürgring, with a ferry tonHull to catch tomorrow. I planned a great line through the Black Forest, from south to north, before an overnight stop on the French/German border. I emphasise “planned”, because for two (occasionally connected) reasons, we were frequently thwarted. I’ve been a GPS user for many years – what the geeks call an “early adopter”. I’ve seen GPS systems become more sophisticated, and “GPS Jane” has become a permanent member of the entourage on most of my journeys to the further flung places. I’ve also become pretty discerning about what I want from a GPS system – things like good, clear instructions, the minimum of chatter, rapid re-routing, and so on. I use a system on my smartphone these days. One less box of tricks to worry about or plumb in to the car or bike electrics. It also means a bluetooth connection takes care of making the sound audible inside a crash helmet or headset, alongside music. But my system has become very picky. The system preferences are all set to give me full choice of locations, but Jane has started to decide which routes she regards as impassable. I first noticed this while plotting the route for one of the days on our tour. Jane had apparently taken against the Oberalp Pass in Switzerland. It’s a great mountain road, and I’ve driven it several times, but this year, Jane routed around it. A detour, had we taken it, of about a hundred miles. I put in a waypoint on the road up the pass – the road showed on the mapping – but the best Jane would do was drive up to the waypoint, and insist then on a U turn back to her detour. I put another waypoint on the road down on the other side of the pass. The result was a tortuous route visiting both waypoints, but never going over the mile or so at the top of the pass to connect them. I’ll concede this was an irritation but not that common a problem….until we got to the Black Forest. There are great roads to ride and drive in the Black Forest, but the best routes are not continuous and need to be pieced together via numerous waypoints. Those were easy to plot. I knew the roads I wanted, and which roads and towns I wanted to avoid. Jane, unfortunately, had other ideas. What ought to have looked like a basically direct south-north line on the map looked more like a Christmas tree, with routes shown up as far as various waypoints, followed by an immediate return back in the opposite direction. With patience, I added several other waypoints and gradually straightened the route out. We set off, but within five miles, hit a road that was closed owing to road works. It did not offer a deviation route. Unhelpful. We turned around, drove back to the last roundabout and guessed an alternative. This was the cue for Jane’s other foible. Unlike her namesake on some other systems, who eventually get the hint that we’re not going to a particular waypoint after all, our Jane becomes obsessed with trying to get us exactly (and only) to our waypoints, often by prodigious feats of re-routing. The only way to persuade her that things have changed, and that we need to skip a waypoint is to go into the software and delete the now inaccessible waypoints(s). And, like the plot of a theatrical farce, Jane then re-routed selectively and discontinuously, until we added yet further waypoints manually to force her hand. Today, sadly, our route encountered about six significant sections affected by closed roads and major roadworks. We got precious little warning of most of them. We’d reach a key junction and find the road we needed was blocked. Several blockages like this suggested no alternative route. We were being driven crazy by what ought to have been a simple re-routing process. And wouldn’t you know it? We then we also met several sections of road Jane deemed completely impassable. She chose her moments badly, and was frequently over-ridden, despite sharp warnings to “Turn around when possible”. The B500, for example, is a great and deservedly popular road. Parts of it give the best motoring in the Black Forest. It’s a bit discontinuous overall, often becoming the B28 or un-numbered roads. It also has loads of sections with daft slow speed limits, which are no doubt an over-reaction to a past catalogue of road accidents. But it exists, and really can be driven. Over Jane’s dead body, apparently. I need a word with the GPS system creators when (or if) we get home, because otherwise, a beautiful relationship will be ending in tears. One more Grinnall Euro Tour-related blog to come. Obvious title for one of my blogs from this big journey we’re on at present, though I was hesitant to use it, because I feel very old, realising that Beatles song is 45 years old now. I remember it like Yesterday, as it were. Our big trip, which began almost two weeks ago with five Grinnall Scoropions, a Mazda MX2 and a TVR is now down to four Grinnalls, plus the Mazda and TVR. Three Grinnalls have had significant brake or clutch fluid problems and the news came through today that one is having to be trucked home by recovery service, because efforts to repair it have failed, and attempts to locate the necessary replacement parts have been a hugely frustrating catalogue of errors by suppliers large and small. The other broken cars (one with brake issues and one with a clutch problem) are back on the road again after nearly five frustrating days trying to get the right parts, and limped 200 miles to join us at 9pm tonight. My last blog saw me wet and exhausted, at Kaprun in Austria. We had three nights there, in a very good hotel indeed. We did some touristy things, including a cable car trip up a 3,000 metre peak, which gave great photos, but I spoiled that day by parking my Grinnall for four hours with the lights on, and totally ruining an already desperately weak battery. I’d been hoping it would just about see us home, but it had to be replaced. Happy to report, there was a local BMW dealer in the town, and a new battery was delivered at 7 am on the morning of our departure. We got to drive and to film the ride over the rather good Glocknerstrasse from Kaprun. I’d been on it a few years ago on my motorbike, but in the Grin it was even more fun. Here’s a three minute clip on YouTube that shows you what it was like. Our journey home really began when we left Kaprun. Until then, our route had mainly been heading east. The bad weather that has dogged our whole trip once more closed in on us, but we managed a great day from Kaprun to Nauders, a favourite Austrian stopping place of mine, taking in the little-known Stallersattel crossing from Austria to Italy, and the Jaufenpass over to Merano. Sadly, neither gave us any views at all, though the roads were very quiet, and good fun to drive. We’ve moved on since, to the southern part of the Black Forest, where we have two nights in a hotel that was once a youth hostel, and basically still feels like one, in a town full of “adventure activitiy opportunities” when all we want to do is eat, drink and sleep. I wish I was organised enough to count how many official (numbered) hairpin bends on mountain roads we’ve driven in the last three days, but it is in the region of 300, maybe more. It’s been a hoot, though our enjoyment has been tempered by sympathy for our comrades with broken toys, and the realisation it could have been any of us, at any time. When I used to ride a bike for sport, I used to have trouble with wind. No, not that sort, the sort that blows the wrong way when you really, really don’t need it. Nowadays, I seem to be having problems with rain. Yes, I know (because so many people tell me) that going on a 2,500 mile jaunt around the Alps in a completely open top sports car is asking for trouble. The “trouble” I was warned of included sunburn and dehydration. Right now, I’d give anything for them! We’re about halfway through the trip, and the 450 miles we’ve covered in the last two days on the road have mostly been in quite abominable rain. We had a day off while staying high in the hills above the Italian Lakes. It was warm and sunny all day. Yesterday, we were woken at 7am by thunder, and set off just after a deluge. Our route was mostly on remote mountain roads in the superb area south from the Brenta Dolomites. Central to it was the Passo Crocedomini which included about 25 miles of single track road with hardly any passing places. Happily, save for (or because of) steady rain, we had it to ourselves just about. Near Lago d’Idro and on as far as Trento, driving the Grinnall was rather like driving a motorised canoe. We were clearly just following the tail of some very severe rain indeed. I run a web site about the Great Dolomite Road, which runs from Bolzano to Cortina d’Ampezzo. You can read all about this fascinating route here. Over the years, I have spent many hours on The Road, as I refer to it, but I had never driven it entirely from end to end in one go, until yesterday. I’d always regarded it as too much fun to be rushed like that. I still do, but some re-planning of our trip left me free of the remainder of the party for 36 hours, and able to revise part of the route to Calalzo, south of Cortina, so doing an end-to-end on The Road became a reality. The clincher was having the chance to video the whole route from the car, which I did, in sections. It had basically stopped raining for much of the time, the roads were wet, and the cloud down pretty low. Stay tuned for those video clips being YouTubed when I get home, and linked to the web site. They came out quite well. We had a dry night, but just as we were loading the Grinnall for today’s relatively short 180 miler to Kaprun, near the Grossglockner in Austria, the rain began. Half an hour later, it was raining with real menace. When the Grinnall is moving, it’s amazing how dry one stays inside it. A waterproof jacket and trousers are useful, and headgear that will cope with the wet, of course. It’s when you slow down or stop that you suffer worst. Saturday traffic on the Italian/Austrian border meant we did a lot of tediously slow driving. All the while, the weather was getting worse. Much worse. We basically opted to keep going, and battled on through near-flooded main roads. Our route was over the Felbertauernstrasse, which has a (we thought) useful toll tunnel. We hadn’t counted on major roadworks leading to the tunnel, nor on the queues these caused. It is as well that the floor-pan of the Grinnall incorporates two drain holes, though I think that at times, as much standing water on the roads got in through these as drained out. Then came a combination of mountain roads, traffic, thick fog, pouring rain, and steamed up goggles. And, of course, nowhere to shelter. It was very scary, but the GPS was counting down the miles. Water had begun to seep in through the neck of my jacket, and when we stopped briefly under the awning of a closed petrol station, I realised I was shivering. The temperature had fallen to 5 degrees C. On an August Saturday afternoon. But you know the rest. We made it. There will be more rain, but we’re promised a “not bad” day soon. I am not a mechanical person. Any DIY and mechanical stuff I do is self taught. At school, I was made to do Latin rather than woodwork and metalwork. I suspect there are tens of thousands of us ex grammar school boys like that. It was a bit of a selling point to me to come on this continental adventure with members of the Grinnall Owners Register that most of them do their own servicing, and some had even built their cars from kit. Unlike me. Ironically, then, it has been three of them who have had pretty major “mechanicals” so far in the trip. There is a “black book” being run. Not sure my knackered battery has got me in it yet, but it’s clear I’ll need to find somewhere over the next few days to buy a replacement. After a night in the underground garage to our present hotel, my Grinnall just about started today. Not sure that would have happened after a night outside in the truly epic storm we had yesterday evening. The other four Grinnalls were out in that, having opted for a different route to the hotel to us. Not sure I’d have wanted to bleed a clutch on one car, and rectify total brake failure in another at the height of that thunderstorm. The hotel garage is full of pieces of car today, or rather, cars in pieces, much to the amusement of other guests. I take my hat off to my companions, who have remained cheerful in conditions that would have had me in total despair. Latest news is that one car might well have to be recovered back to the UK if a trip to a local garage this afternoon fails to come up with the right brake seals. Seals that were originally for a 1995 Ford Fiesta are not likely to be easy to find in Italy, of course. We have driven to here (Lago d’Iseo, near Brescia and Bergamo) from Central France, via Annecy, Chamonix, and Andermatt, over several big mountain passes and miles and miles of really interesting roads. Weather has been very mixed, with us getting a soaking and a roasting at some point on most days. My biggest regret was crossing the Julier Pass, to St Moritz yesterday and the Bernina Pass just after, in very poor weather indeed. Mind you, it might have been more serious. It seems I may have done many of the miles between Annecy (last complete check-over of my Grinnall) and here, with no rear lights or brake lights. This morning, I discovered the connector to them was undone. No idea when it came loose, or how. Now very firmly taped up. Happily, that connector didn’t affect the rear indicators, though. We are in an Italian hill village for two nights, in a very good hotel, which is a plus. The minus is the 10 kilometers of hairpin bends up to the village, on a tiny road which (as we found out on our way up yesterday) is nevertheless a public bus route! Tomorrow, what I’m sporadically tweeting under the #bigtrip hashtag moves on to the Dolomites, my spiritual second home these last 30 years. We’re only passing through really (sadly), and the forecast isn’t good. Total trip mileage since home will pass 1,000 somewhere on tomorrow’s stage. One Grinnall (the trip organiser’s) now declared dead. Needs a part that is being shipped direct from the UK to our Austrian hotel. Another Grinnall needs clutch work, and that hotel has a workshop. Because I am keen to video footage of The Great Dolomite Road for my web site about it, I’m heading to tomorrow’s intended stop near Cortina d’Ampezzo via a slightly altered, but nevertheless long route. The rest of the party are accompanying the dead Grinnall’s recovery truck direct to Austria for an extra night there, and we’ll meet up with them on Saturday night. Means I stay pretty close to original route, and get some video done as we drive my very favourite roads. There are downsides, such as being away from the rest of the group for 36 hrs and not having their mechanical expertise. We tried and failed today to source a new battery for my Grinnall today, so some starts, particularly in the mornings, will be pushes, but we’re confident that if we can survive two days on the road, and get to our Austrian hotel, we can get a battery somewhere within reach of that. Dull it isn’t, though the weather might be, sadly. We have completed the second day of our trip in the Grin – see yesterday’s blog. We’ve reached that delightful nowhere land in France that sits south of the Ardennes and west of Burgundy. Our last several miles to Brienne were characterised by seemingly dormant, apparently windowless villages, all about a mile long, separated by a few hundred metres where the speed limit wasn’t 50kph. Speed cops must have regular field days here. We’d been where speed was once a must, earlier in the day. A few years ago I found by accident (ie, I was lost at the time) all that remains of the once famous Reims motor racing circuit. Closed in 1972, with little evidence left save the shells of the very evocative pit, paddock and grandstand buildings, this was, for 50 years, one of Europe’s premier motorsport venues. All the greats of the post WW2, pre 1970s years raced here. Today, after driving the delights of part of the Chemin des Dames and a long stretch of what was Stage 6 of this year’s Tour de France, we reached Gueux on a scheduled stop, and drove around those roads that still remain on the circuit. Great to see there is a classic motorsport event here on 14 September this year. I’m sorely tempted to return. Gps Jane hated me today. Her idea of the way to our venue was motorway all the way, and she nagged us endlessly. I was determined to sample the roads through the champagne vineyards towards Epernay. It reached the point where the “right” route for me was the polar opposite of her instructions. A good but ultimately wearisome game. Anyhow, we arrived at our venue by 5pm, ahead of our compatriots on the Big Trip, who are all from “oop North” and had journeyed from Belgium after a night on the Hull-Zeebrugge ferry. Living in Kent, we’ve always felt privileged that some people hate the place so much they built tunnels at both ends to let people get out easier than that. Not so our compatriots, who misjudged the timing of their trip from Zeebrugge and arrive at nearly 9pm. Several hotel rooms had been reassigned by then, and the rather good restaurant in the hotel was only narrowly persuaded to carry on serving. But it was a great sight to see four other Grinnalls driving into the hotel carpark. They, plus a TVR and a Mazda, are the crews we will be travelling with for these next two weeks. Stay tuned. I have a love-hate relationship with France’s A26 motorway. It whisks me into the heart of France regularly enough, and usually provides the final sad miles back towards home at the end of an adventure. It also regularly vexes me with its weather. Today was one such day. I hate setting out on a journey when it’s raining, but I hate getting caught unprepared by the rain even more. We got utterly stuffed in a thunderous downpour today, about five miles from the nearest shelter. On this trip, weather like that is a big issue. 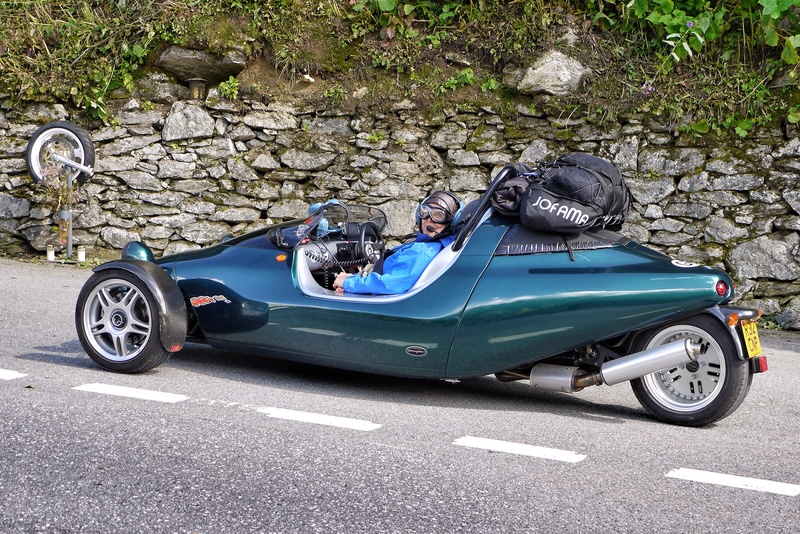 We are, god help us, just starting out on a 2,500 mile tour of the Alps in a thing called a Grinnall Scorpion 3. It is, as you’ll have seen if you clicked the link, a small, 3 wheeler sports car, powered by a big BMW motorbike engine. Like me, it has an open top. I can put a hat on (leather flying helmet and goggles being the preferred headgear), but the Grin, as I call it for want of a name) cannot. It is open, without even the option of rain cover. In fact, apart from a remarkably effective windscreen, its only concessions to bad weather are the two drain holes in the floor, to allow rain out. Leaving Calais, it was fine weather. A few miles on, however, and the sky resembled something from one of my old meteorology textbooks – huge anvil clouds, underneath which our route descended. We were aiming for a lunch stop at the Aire du Rely, home normally to second breakfasts on earlier starts. We got beaten by the rain, as the Grin became the equivalent of a motorised canoe for a while and were, erm, a bit damp on arrival. We’d normally drive wearing some kind of waterproofs if it’s wet, or wait until it stops. We were seriously caught out this time. When we set out after an extended lunch break, we wore them. Wouldn’t you know it? The sun came out for the remaining 50 miles. “We” on this trip are me, my wife, aka Co-pilot, our customary furry travelling companion, who has frequently appeared in my blogs, and Jane. Jane runs the GPS. I’ve never met her face to face, and she’s a terrible know-it-all who insists on having it her own way. And the trip? We’re due to meet up with several other Grinnall owners near Troyes tomorrow evening, before the real fun of the next fortnight begins. I plan to blog the trip occasionally, so keep watching this space. When we have wifi, I’ll be tweeting under the #bigtrip hashtag. At tonight’s hotel, I’ve seen a weather forecast. I am hopeful. I’ve neglected this blog for the last couple of month. That period has also seen the bulk of my competitive season for this year. There is a connection. This blog seemed to have been becoming a bit of a jinx. I’m certain that’s nonsense really, but no sooner did I declare myself fit and well here, then something went wrong. And if I wrote about being hurt (sadly, all too often) then I went out and surprised the pants off myself by racing well. Of course, it’s impossible to write regularly about what it’s like to be an older athlete without mentioning injuries, and it would be pointless to conceal those injuries. All Masters athletes have them – sometimes severe and career-threatening, sometimes, as with most of mine, “just” persistent, annoying small breakdowns of one part of the system or other. However, as you’d expect, not writing anything for a couple of months has made no difference at all to my running, or to the ebb and flow of those system breakdowns. So, rather than sit feeling guilty about not writing, and risk letting the blog lapse, I guess I should carry on. Being a new entrant to the ranks of the over sixties since March hasn’t made a huge difference to my running this year. In the local League, there are limited opportunities to race other M60s, and as often as not, I’ve raced as the Club’s 50-59 year old sprinter, or even as it’s B-string 35-49 year old. And that’s not been without quite a rewarding level of success. I’ve supplemented my season with a few local open-graded meetings too. I love these events. They are all usually a simple case of “turn up, pay your entry fee on the night, race”. This means that I seldom go to one when the weather is bad. I’ve raced on some beautiful evenings this year. The races in open-graded meets are seeded from the race time you declare when you enter. Age or gender are not relevant. The result is that, when you’re an “oldie” like me, you usually get seeded against a mixture of other older athletes, and youngsters on their way up – lads and lasses. It might sound a bit hit and miss, but in reality, it makes for some really close races. Twice this summer I’ve been pushed to a new age-group record for my Club by the intensity of an open-graded race. There has been a price, however. I put 101% effort into the lead-off leg to a sprint relay in May, and hurt some muscles in my left side. This created a well-known spiral of events. The injury restricted my training, or at least, forced me to do stuff other than running. However, I still had commitments to run for my Club, and a desire to make the most of being a new M60, so I carried on racing. You can’t get a quart from a pint pot, as they say, and it wasn’t long before my painful side/hip was accompanied by an increasingly sore left Achilles tendon. It simply wasn’t getting prepared for the battering I was giving it in each race. The end-result has been that I’ve been a bit of a wreck after each competition, making good use of pain-killers and ice for a couple of days, and ramping up the bills for remedial treatment. Positives are that I have been very consistent indeed. All my 100 and 200 metre races have been run in a very narrow range of times. I’m sitting somewhere quite near the top of the British rankings for those events for my age group, too. So, pain or no pain, I am going to look back on 2014 as a successful summer, I expect. A few days from now, I have my season finale, at the British Masters Championships in Birmingham. I am then promised away to the Alps on a bit of an adventure that I think I’ll be blogging about, so I am not going to the European Masters Championships in Turkey at the end of August. There may be a few low-key competition opportunities in September, but otherwise, that’ll be it for 2014. I can’t deny that being 60 this year has been a real motivator in training. Things like the Masters age-weighted tables tell me that I am racing as well, or possibly better, than I have ever have. Emphasis there is on the word “racing”. At the level of “running” it’s a world of annoying pain. Maybe an early end to the season’s no bad thing. Maybe it’ll give me some quality time to get things fixed before I start the full load of winter training. Not completely sure that being 61 next season is going to be quite such a motivator, though. You are currently browsing the Blog from a Faster Master blog archives for August, 2014.